& skillfully brewed to perfection. Every time. We believe taste trumps trends. We’re from the Northwest. We love the outdoors and we love our classic beers. Call us old-school, but we brew beer to drink and enjoy, not to intimidate or impress. Trends come and go, but exceptional taste nevers goes out of style. We use our skill, our heart, and only the best stuff to brew all of our beers. 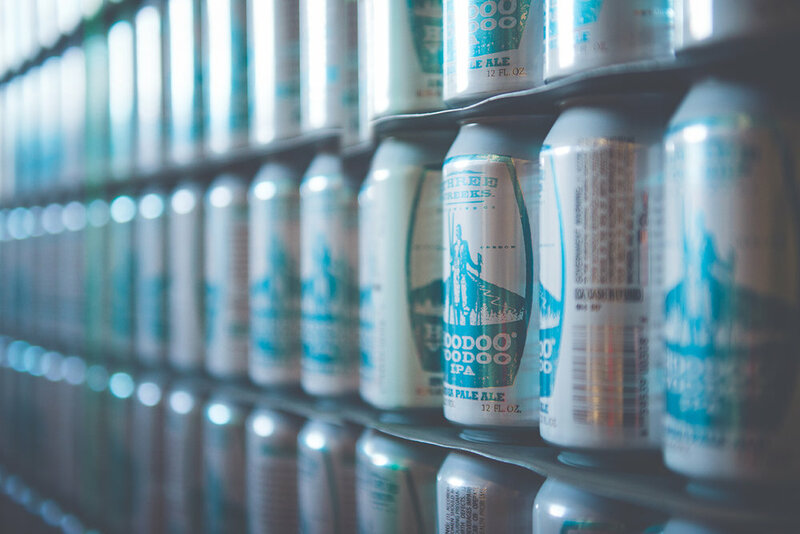 Like the finest malts from around the world, hops right out our doorstep, and pristine water from our own Cascade Mountains. Because we believe how each of our beers are made and what it’s made of matters a lot. that ride, or take a 6-pack with you up the trail. A light bodied, sassy Blonde ale brewed with a kiss of Sterling hops and the finest Canadian 2-row barley. Simple, yet beautiful. Available on draft, 22 oz bottles and 12 oz 6-pack cans. The classic NW India Pale Ale features a chewy malt character that perfectly balances the explosion of resinous grapefruit hop flavor and aroma, courtesy of generous additions of Columbus, Centennial and Liberty hops. A robust Porter that features 2 pounds per barrel of the finest Belgian dark chocolate, creating a slightly roasty pint with underlying chocolate sweetness. A new wave IPA with a simple malt bill that showcases sought after hop varieties, such as Mosaic and Simcoe. Expect heavy, resinous pine and citrus flavors. It’s like a majestic citrus forest! Available on draft and 22 oz bottles and 6-pack cans. Flavorful styles to pair with our changing seasons. This simple malt profile of Canadian 2-row, Munich and a just a bit of Crystal malt allows the five separate hop additions of Eureka! to engulf your senses. Recently developed as an experimental hop by Hopsteiner Farms, Eureka! is complex, including resinous pine and fruity notes - which range from tropical citrus to dank stonefruit. Eureka! is truly a star as a single-hop IPA. A great variety for the "classic hophead.” Strike gold with Eureka! Available on draft and 22 oz bottles January - March. This easy-drinking Mexican Cerveza transports you south of the border. Pilsner malt and Saaz hops create a clean, crisp and refreshing lager, while traditional flaked maize adds just a touch of sweetness. Lagered for two months, Tres Arroyos is sure to please the most discerning palate. Salud! 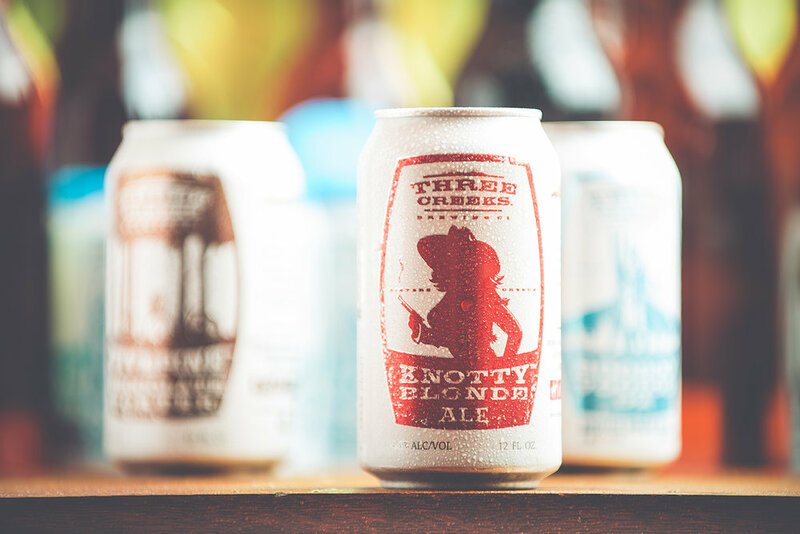 This unfiltered ale is a brewery favorite. Made with 20% rye malt and a splash of honey malt, Stonefly is a wonderfully balanced, medium-bodied beer. Featuring classic Northwest Crystal hops, plus a dry-hop addition of Strata hops. You’ll love the refreshing taste, which offers hints of spice and citrus, along with a crisp, lightly-hoppy aroma. Even the most finicky fish will be hooked! Available on draft and 6-pack cans July - September. A new TCBC brew created for life’s adventures in the great outdoors. Brewed with a touch of crystal and honey malt plus just enough dry-hopping to load up your senses, creating this refreshing and crisp pale ale. Brewed specifically to support our friends at Warfighter Outfitters - who provides Central Oregon fishing & hunting trips to Military Veterans - TCBC will donate 10% of all Warfighter sales. We encourage you to visit www.warfighteroutfitters.org to learn more and donate along with us. Available on draft and 6-pack cans October - December. Limited release, high gravity, special edition. We amped up our FivePine Chocolate Porter by adding double the chocolate malt and double the dark Belgian chocolate into the boil – a whopping 4.5 pounds per barrel! The result? A true dessert beer featuring a full body and intense chocolate flavor. A chocoholic’s dream! Available on draft and 22 oz bottles January - April. Big. Bold. Beautiful. This magnificently - hoppy, Imperial IPA embodies everything Three Creeks represents: passion, persistence and dedication in the pursuit of crafting great beers! Expect big notes of citrus, tropical fruit and piney goodness. A decade of great brewing history all rolled into one special beer. We are proud to share this special milestone with all of you. Cheers to 11 years TCBC! Available on draft and 22 oz bottles May - August. This collaboration with Sisters Coffee Roasters features 4 pounds per barrel of Sumatra dark roast coffee. The base beer is a big imperial stout brewed with 10 different malts, along with Cascade hops. The final beer is dominated by rich coffee aroma and flavor, while still allowing the base stout to push through. Available on draft and 22 oz bottles September - December. new beers, more flavors, & special editions. We amped it up a notch!! We aged our Frontier Justice in Rye Whiskey barrels for over 9 months! Our yearly collaboration with Sisters Coffee Roasters features 4 pounds per barrel of Sumatra roast. The base beer is a big imperial stout brewed with 10 different malts and cascade hops. The final beer is dominated by rich coffee aroma and flavor when fresh but will allow the base stout to poke through as it ages…now throw in a little booziness from the whiskey. Available on draft and 22 oz bottles January - February. This barrel-aged Imperial Chocolate Porter features double the chocolate malt and double the Belgian dark chocolate or our GABF® gold medal-winning FivePine Chocolate Porter. Then aged in local bourbon barrels for 1 full year before blending and packaging. The result - A true dessert beer with a full body and intense chocolate flavor featuring notes of vanilla & oak. Available on draft and 22 oz bottles March - May. We commandeered a bit of our 2018 batch for some “quiet time” in neutral, red wine oak barrels courtesy of Naumes Family Vineyards of Medford, Oregon. Enjoy enticing notes of banana, nutmeg and clove; a touch of citrus from Simcoe, Eureka and Crystal hops; plus, hints of vanilla, oak and mild tartness from the wine barrels. 'A Votre Santé' – Cheers! Available on draft and 22 oz bottles June - July. Our award-winning Stampede Ale has been aged for over a year in Rye Whiskey Barrels. This beefy Northwest style brew is built on a base of German and British malts, then heavily hopped. Crystal, Special B and Maris Otter malts, along with a 3-hour boil, contributing loads of plum-like, dark-fruit flavor and brown sugar notes. You can also taste hints of oak, spice and vanilla from all the time camped in the Whiskey Barrels. Available on draft and 22 oz bottles August - October. Bigger & badder! We allocated a portion of our 2017 Rudy for 12 months of “down time” in Rye Whiskey barrels. Expect a big whiskey kick along with hints of oak, vanilla and spice on top of this well-balanced, heavily-hopped, big ol’ red ale. Available on draft and 22 oz bottles November - December. Our 2019 batch of McKay’s Scottish Ale is brewed with two distinctive 2-Row base malts, four varieties of crystal malts and a touch of smoked malt, creating rich, caramel flavors with a hint of smoke. Lightly-hopped, allowing the complexity of the malts to shine. Brewed in honor of Mr. Don McKay – our favorite local. Cheers to you Don! A complex blend of Munich and Crystal malts along with Cluster, Amarillo and Chinook hops, resulting in a ruby-hued, well-balanced Red Ale packed with Northwest hop flavor that honors our "Soot-Blackened Heroes"
Available on draft and 22 oz bottles July - September. Our Saison reflects a classic, harvest-season, farmhouse ale born long ago in the French & Belgian Countryside. The yeast is the star in this refreshing & easy drinking, old-world style. Enjoy enticing notes of nutmeg, clove and cinnamon from the farmhouse yeast strain, subtle tartness & spiciness from the addition of rye malt, and a touch of citrus from Simcoe, Eureka and Crystal hops. Available on draft and 22 oz bottles April - June. Available on draft and 22 oz bottles July - August. Our annual fresh hop pale features 300 lbs of wet Centennial hops from BC Farms in Woodburn, Oregon. The hops go from farm to brew kettle in 4 hours. The abundance of hop resins create a spiciness, along with the classic orange-rind & floral notes of fresh Centennial hops. Available on draft and 22 oz bottles September - October. Rudy is back! The 2018 batch of our annual holiday release of this big ol’ red utilizes 10 different malts and a blend of old school & new school hops. A 2-hour boil concentrates the rich dark malt flavors, creating a holiday beer that’s sure to light your way.